Jesse Liberty,a Developer Community Program Manager for Microsoft, starts off IndyTechFest 2010 with the keynote presentation. On Saturday, May 22, 2010, over 400 SQL Server, .NET, SharePoint, Silverlight, and Windows Phone professionals gathered together and spent a free day of training at IndyTechFest, sharpening their technical and career skills, choosing from 37 different presentations in seven different tracks. 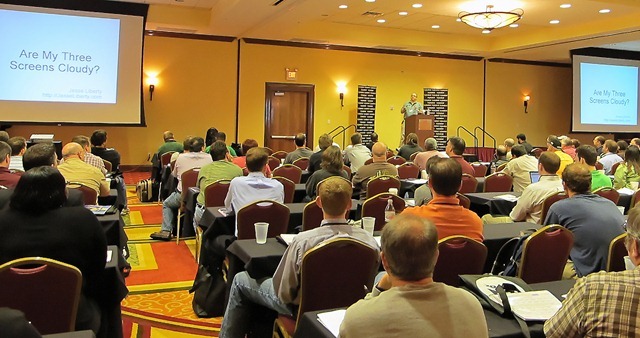 IndyTechFest, which was held at the Marriott East Conference Center in Indianapolis, IN, is the third time this event has been held, and was organized and managed by over two dozen volunteers from the IndyNDA and IndyPASS user groups. The event’s main organizers included Bradley L. Jones, David R. Leininger, John Magnabosco, and Mark McClellan. There were two SQL Server tracks, which included speakers such as Kevin Kline, Kathi Kellenberger, Jessica Moss, Tom Pizzato, Jimmy May, Hope Foley, Craig Utley and Derek Comingore. I gave a presentation on “Database Maintenance Essentials”. One of the highlights of the event for me was attending the speaker’s dinner, held after the event. I got the opportunity to spend time getting to better know many of the other SQL Server speakers. This is the third time I have spoken at IndyTechFest, and I hope to be able to attend next year.